With fifteen years of experience, Sunshine Chocolate Fountains are the original and most experienced professional chocolate fountain caterers in South-East Queensland. 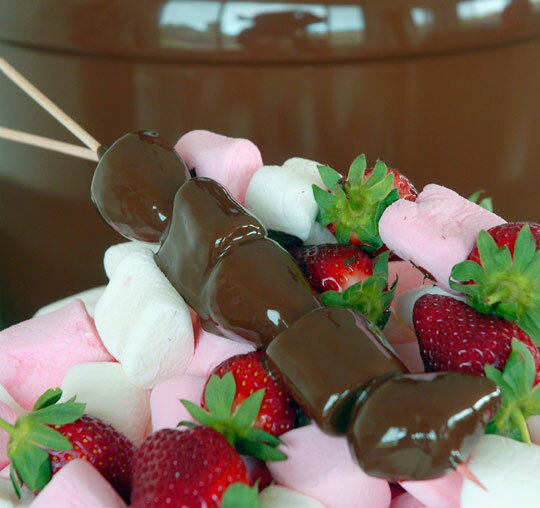 We have been providing liquid chocolate fondue fountain hire for Brisbane, the Gold Coast and the Sunshine Coast, Queensland, since 2004. Sunshine Chocolate Fountains to hire are available for weddings, trade shows, functions, birthday parties, baby showers, hens parties conferences, conventions… you name it. Chocolate fountains are impressive, eye-catching and make a fun and memorable impression. Sunshine Chocolate Fountains are the original local providers of Chocalate Fountains in Queensland. Chocolate fountain rentals are available for the entire QLD South-East and Sunshine Chocolate Fountains have provided chocolate fountain hire for Brisbane, Gold Coast, and Sunshine Coast events including amazing Maley, Montville and Noosa Hinterland weddings. Oozing, decadent Sunshine Chocolate Fountains are a decadent and delicious addition for your wedding reception. Tiered fountains flowing with high quality liquid chocolate first became popular in the party capitals of LA, New York and London. Modeled to replicate the design of a tiered wedding cake, the fountains are designed to provide a never-ending waterfall of the highest quality Callebaut chocolate. Sunshine Chocolate Fountains add the essential WOW factor to your reception, starting with the amazing smell of the chocolate as you walk in the room. Ther is no escaping how fun and festive it is. People just love to dip. Sunshine Chocolate Fountains has been a huge hit at baby showers, hens parties and birthday parties. We are pleased to offer a chocolate fountain rental service for Children’s Chocolate Parties. Kids LOVE dipping all sorts of fruit, marshmallows and lollies into the chocolate. Our fountains are great for kids birthday parties, christenings, naming ceremonies, bar mitzvahs, bat mitzvahs, school graduations, sporting team celebrations, and all events for chocolate lovers. Sunshine Chocolate Fountains have had huge success with coloured and pink chocolate fountains and we can create a gorgeous chocolate fountain in any colour for your event for a small surcharge. Make sure your child’s party is the talk of the town with a Sunshine Chocolate Fountain in dark, milk, white chocolate, or all three! Our medium dark chocolate fountain was the centrepiece at this 60th birthday party on the Sunshine Coast. Guests dipped white marshmallows and fresh strawberries! Wedding guests loved our medium chocolate fountain with dark chocolate at brunch, the morning after the wedding on the Sunshine Coast. Guests were spoiled for choice with our milk chocolate medium fountain, dark chocolate large fountain and white chocolate medium fountain at a Gold Coast hotel. They dipped wafer straws, strawberries and different kinds of melon. The medium chocolate fountain with dark chocolate was a hit with participants at this conference in Brisbane. Our large chocolate fountain with dark chocolate is perfect with marshmallows! Costco chose Sunshine Chocolate Fountains white chocolate, milk chocolate and dark chocolate fountains for their store opening in North Lakes near Brisbane. Our dark chocolate fountain was a show stopper at this Brisbane wedding. Our medium dark chocolate fountain was a hit at this Trade Show with a long line of people willing to exchange a business card for a chocolate-covered marshmallow or strawberry. The very best Belgian Callebaut Chocolate is melted then installed into a health-grade-stainless steel fountain which operates electrically. The result is an over-flowing of delicious liquid chocolate cascading over and around the fountain. Skewers are threaded with marshmallows, fruit, pretzels, or whatever you would like to smother in chocolate. Even small shot glasses can be filled with chocolate and served with side plates of fruit or marshmallows. Guests then entertain themselves and eat the chocolate in their own way and to taste. Dark, milk or white chocolate is available and we can customise a colour just for you. Pink chocolate fountains are especially popular.